Rug as pictured.... slips around a bit even with the nonslip pad I added under. 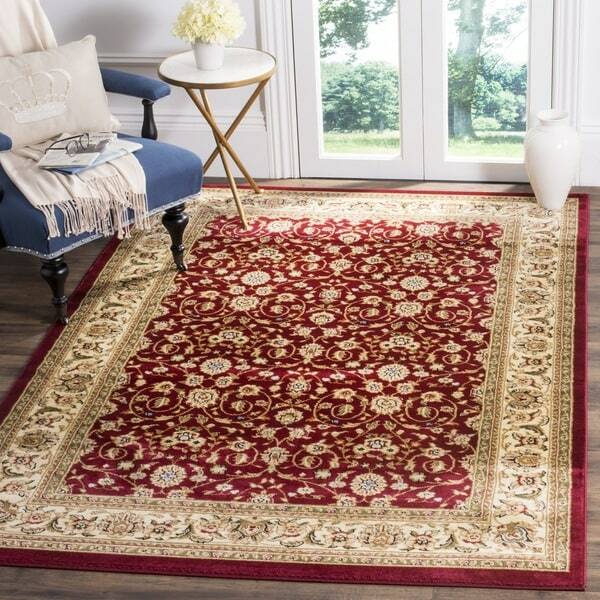 Safavieh Lyndhurst Traditional Oriental Red/ Ivory Rug - 5'3" x 7'6"
Richly colored and beautifully detailed, this traditional rug draws inspiration from Persian and European designs. This rug features a main color field of burgundy red with an ivory border with beige and green accents. With a power-loomed construction and polypropylene fibers, this rug is virtually non-shedding for easy care. Safavieh allows you to decorate with classic designs at a comfortable price point. Dimensions 3 ft. 3 in. x 5 ft. 3 in. Excellent rugs for the price. Very nice rugs, I bought a 12x3 and 5.3x3.3 and they look awesome in my hallway/landing. They are good quality rugs for the price, not the thickest and not the thinnest. Feels soft on feet and does not curl up when vacuum cleaned. Just right if you ask me. There is small spots of baby blue which you can see if you look carefully. Rugs were what I expected. We purchased two of these rugs and are very happy with them. The color is a rich burgundy and true to the picture on the website. They are not thick rugs, but they fit our needs and look great in our room. A great deal, too. Just be aware if you plan on putting this rug at a doorway, you will probably need a non-slip pad to go underneath. It will slide around without something on top of it. This is the only rug I have purchased from Overstock that is not all naturalfabric (with the exception of kitchen mats and doormats). It is really a pretty rug with a surprising plushness. I bought the hall runner to match. This rug lays very nicely without a pad underneath. It is easy to work with and easy the clean if something spills. For a non-wool rug, this is a winner. These rugs are beautiful and lush, they fill soft and luxurious under your feet. They are beautifully designed and are quality product. This size is perfect for my entryway. I definitely recommend. Very nice looking, well constructed rug. We had previously purchased the 11X14 rug, then we purchased this matching, smaller rug to go by the door to complement the larger rug. We are very pleased with these rugs! It really is a beautiful rug. I bought this for a guest bath. It didn't look that good in there, so I gave it to my sister for her office. The rug has much more vibrant color than it looked on my monitor. I thought it was in more muted shades. This rug is beautiful! I searched all over for a rug the right size to fit our front door foyer. The pattern is beautiful and the rug is extremely soft. It is a great value for the price. Buy it! Beautiful rug but Overstock sent the wrong color. Rug is fine but we ordered Burgundy/Ivory and received Red/Ivory. Had to return and pay the shipping for their mistake???!!!! Good quality, easy to clean, non skid intact. Looks great. See my other review on it’s larger size. I wonder how well it will burn. It’s not good for anything else.